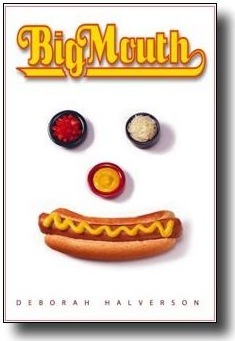 Once again, hot dogs steal the headlines of America’s newspapers–no, make that the WORLD’s newpapers: Joey Chestnut retained the Mustard Yellow Belt, eating 59 hot dogs and buns in 10 minutes, plus another 5 more in a sudden death tie-breaker against his nemesis, Takeru “Tsunami” Kobayashi. In the end, Chestnut beat Tsunami by a single dog. Since BIG MOUTH features this event and just pubbed last month, I’d wanted to be at the contest to see the showdown between Chestnut and Kobayashi in person, but it wasn’t meant to be. I was there last year, though….and boy, was it an experience. Here’s a link to the post I wrote about that: “66 Hot Dogs in 12 Minutes” Imagine 50,000 people squeezed onto one streetcorner, with little 5’2″ me standing on top of a police barrier calling out the play-by-play to the crowd below me. The post also covered my own eating experiments as I “researched” Big Mouth. Eating hot dogs, Three Musketeers bars, gummi bears, ice cream sundaes…it’s a rough life, suffering for one’s art. 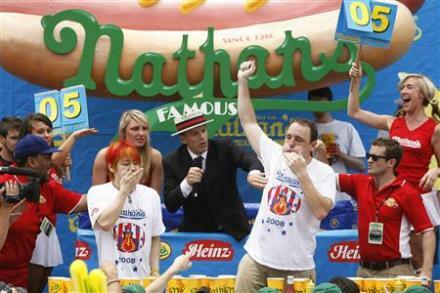 This year the Nathan’s Famous contest was shortened to 10 minutes instead of 12. Supposedly the promoters discovered that the original contest in 1916 was only 10 minutes long. But since the Shea brothers are the kings of fantasy facts and good-natured hyberbole, I don’t believe that reasoning. Not that it matters either way. Regardless of length, a hot dog eating contest is still a hilarious and bizarre and totally American thing to do. In case you missed the showdown like I did (I was at a softball game with the boys, also a very American thing to do on this holiday), Youtube.com already has the contest posted, and Reuters has a good write-up of it. Or, you can read about it in BIG MOUTH, which has its own share of fantasy facts and good-natured hyberbole. And a lot of funny stuff about ketchup and mustard, too. After all, where there are hot dogs, there must be red and yellow goo. 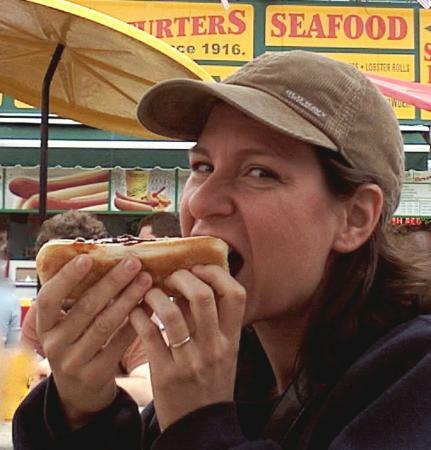 A hot dog just wouldn’t be American without them. Denis and I both watched it today . . . really gross!!!! !